Economic solution for network time synchronization. Each computer on Network can adjust own local time to GPS server. Device built in real time clock is synchronized through the GPS satellite system. GPS - Global positioning system is joined to Cesium Atomic Clock standard. Time Server has built in GPS receiver. Active antenna is delivered with device also. 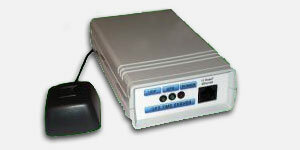 GPS Time server built in 10-BaseT native Ethernet connectivity. NTP time protocol is main base of server. Its independent platform such as WIN2000,XP,LINUX,UNIX BSD ... Implemented Web server in device, used for setup IP address, mask, Gateway and status of satellites. SNMP traps available for GPS signal loss, visible satellites counts. NMEA Standard protocol on RS232 output. Backup lithium CR2430, user replaceable. Adjusted every 10 seconds from GPS receiver. DC 9..12V / max 300mA without antenna power consumption. Active antena distributed with 5m cable length. ICMP, SNMP traps for satellite monitoring, MIB file description in provided manuals.